On page 18, students from the Sacramento Adventist Academy studying the Donner Summit Snow Pack after a record precipitation winter. In the Spring edition of the Sierra Club’s Clair Tappaan Lodge Newsletter, student research on the Sierra snowpack was featured on pages 5 and 6. Students from the North Tahoe Middle School conducted research projects to study how humans have impacted the geology and biology of Martis Valley. Headwaters Executive Director Meg Seifert to give a talk on our relationship with science and education at TEDxTahoe City September 17th. These 6th grade students at the North Tahoe Middle School designed research projects to learn how erosion works and impacts their school in the Lake Tahoe Basin. An article on a Truckee High School class who designed projects to learn one two local streams contained different levels of aquatic insects. 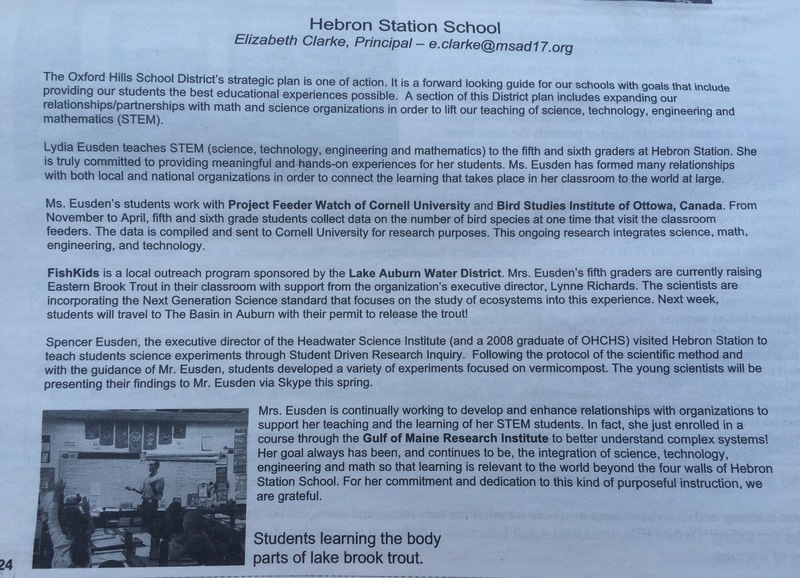 A newspaper article on the Kindergarten and 1st grade class at Donner Trail Elementary who had their research questions on Lahontan Cutthroat Trout published in NPR’s Science Friday Podcast. The Science Friday Podcast mentioned above and the “Take A Sample”program the Donner Trail students took a part of. Headwaters instructor Spencer returns to his home school district to help students conduct research projects around composting with worms. A feature of Headwaters, it’s origins and mission, as part of Give Back Tahoe’s series on local non-profits. An article the Truckee High School River Ecology class who designed their own research projects in the Van Norden Wetland.